Analyst installations provide an Excel-based metadata editor environment for defining the metadata required to build BimlFlex solutions. The BimlFlexSetup Installation file contains the BimlFlex Excel Add-in and the BimlFlex SSIS Custom Components. 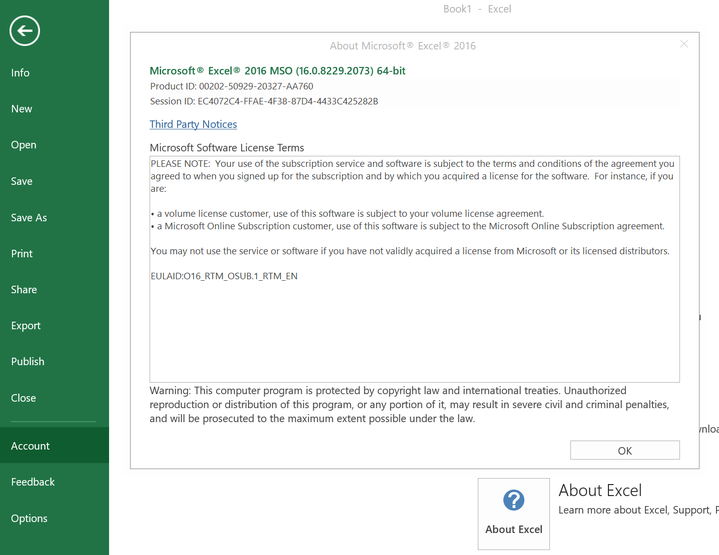 The BimlFlex Excel Add-in installation needs to match the installed version of Excel. To find the installed version and its bitness, open an Excel spreadsheet, click File, Account and About Excel. The version specification includes either 32 bit or 64 bit. The BimlFlex Setup Installation file contains the BimlFlex application, BimlFlex Excel Add-in and, optionally, BimlFlex SSIS Custom Components. Run the BimlFlex installation and choose what options to install. Only a single version of the Excel Add-in matching the installed bitness of Excel should be installed. Analysts only need to have the BimlFlex metadata functionality installed to interact with metadata through Excel. If building and BimlStudio project management is required, follow the steps in the Developer installation guide. If the Applications or components require uninstallation, they can be uninstalled from the normal "Uninstall a Program" option in Control Panel, Programs, Programs and Features.